All of us have some ideas about how we’d like to grow and improve. You may want to get better at providing performance feedback to your employees and coaching them about your expectations. Or you may want to improve some aspect of your communications skills. 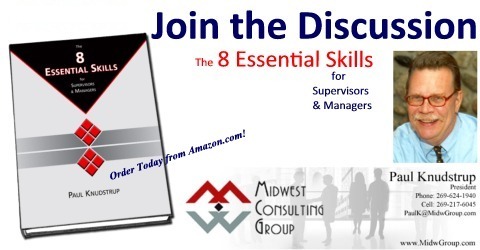 Perhaps you want to improve your organizational, personal productivity, decision-making skills. Or you might want to develop your skills in more “big picture” areas, such as strategy, teamwork, or project management. As you think about your current job, are there areas that could stand some improvement? What kind of job would you like to do next? What skills do you need to acquire to be ready if the opportunity comes along? Whatever your current situation, start thinking and behaving like your growth and development is your own responsibility. Because it is. How about you? What areas are you growing in these days? What are your developmental plans for the rest of this year? Growing Yourself may be the most important of The 8 Essential Skills. What do you think? Your success as a leader will be built on a foundation of two things: (1) your ability to get things done or accomplish tasks, and (2) your ability to forge and sustain positive relationships with other people. True leadership means focusing on both tasks and relationships. No matter how driven, focused, and hardworking you may be, you won’t be effective in life unless you can develop solid, healthy relationships. In today’s organization your ability to build successful relationships with employees, peers, your boss, and customers is a key skill – one that can help move you and your unit ahead or significantly hold you back. What do you think? Of the 8 Essential Skills, it seems to me that Building Successful Relationships are another key skill. As colleague and coach Mary Jo Asmus says, “It’s all about relationships.” So, what do you think is involved in Building Successful Relationships? How well you communicate, and how effective you are at using all methods of communication, have a great deal to do with your individual success and the success of your team and organization. When we examine why a manager’s career derails, we often find poor communication skills are a significant part of the problem. As a manager, you will often use verbal and written communication to prompt another person to behave in a certain way or accomplish a specific task. Regardless of your purpose, you want to create, transmit, and receive information as effectively as possible. At the same time, you want to build understanding and enhance your working relationships. What do you think? Of the 8 Essential Skills, it seems to me that Communication comes next after Managing Yourself. So, what do you think is involved in effective communication – Communicating for Results?